It's good to know that, whatever innovations are happening in Jazz, whatever the avant-garde are up to, you can always rely on some artists to deliver a set of straight-ahead hard bop that, while it doesn't innovate, just cooks (Well, I say 'doesn't innovate' and in form that's true, but how many 1960s hard bop sessions featured tuba and euphonium?). 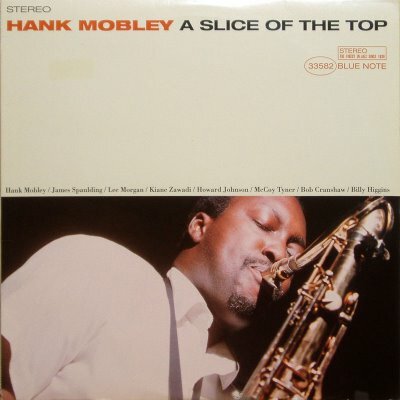 So it is with Mr. Mobley, and 1966 Blue Note session is a great example of that. 'Hank's Other Bag' gets straight to work - after an ensemble opening, Tyner gets down to it, creating a funky, blues drenched solo that perfectly sets the mood for the rest of the album. Mobley's up next, before Morgan has a go. He's on stupendous form on this date. Look out for the other brass, especially Howard Johnson on tuba, what a versatile player! As well as turning his hand to straight-ahead music like this, he can also be heard on free jazz classics like Pharoah Sanders' 'Izipho Zam' and big-band works along the lines of Gil Evans' 'Blues In Orbit'. It's sad that he doesn't get a solo spot but his presence enhances the whole set. 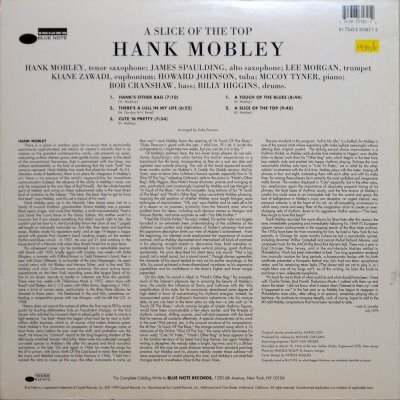 The ballad, 'There's a Lull In My Life' features some sensitive playing from Mobley, although it's best feature is the supportive playing by the ensemble, who treat this like a big band number despite there only being 6 horns on the date. 'Cute 'n' Pretty' has some uncredited flute playing (probably by Spaulding - a former Sun-Ra sideman!) and a nice melodic groove supporting the soloists. 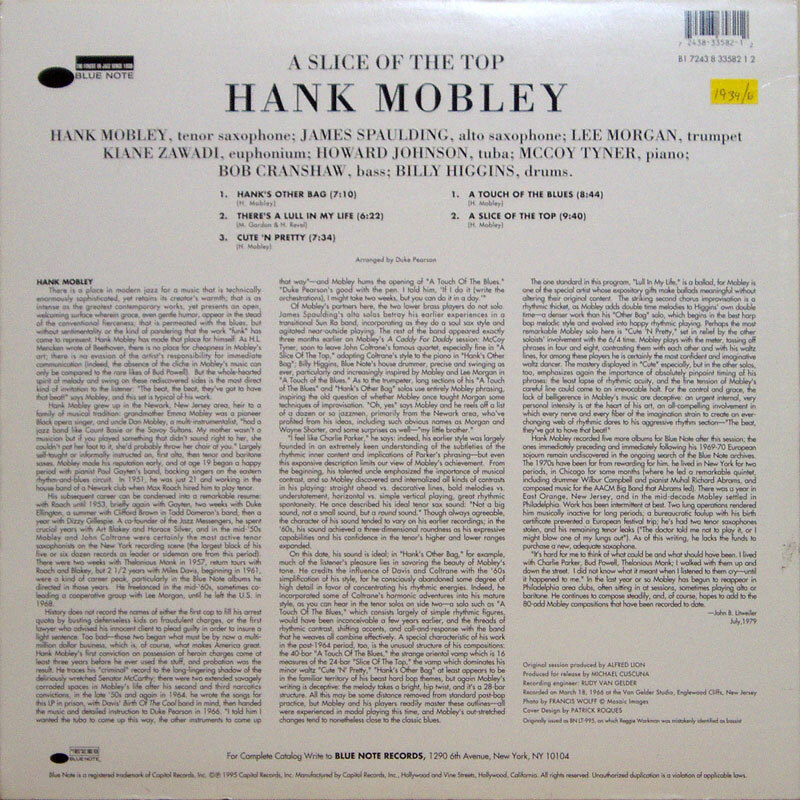 Side 2 kicks off with 'A Touch Of The Blues' doing exactly what you'd expect - a big blues performance with some inspired parping from the low brass in the theme and a fantastic series of solos from Mobley and Morgan that could be interchangeable for all the difference in style between them. 'A Slice Of The Top' is in more adventurous harmonic territory with a sinister minor key theme aided and abetted once again by the colourful presence of Johnson and Zawadi. Unfortunately, at time of writing, this set was still unavailable on CD (come on, Blue Note!). It was only released in 1979 having been recently discovered - according to the sleeve note several other sessions from around this time remain to be heard. Nevertheless, it's a sound LP and well worth seeking out if you like a good bit of unpretentious hard bop with a little colour to distinguish it from the crowd. It's time for this to be re-released. 2007 and counting.